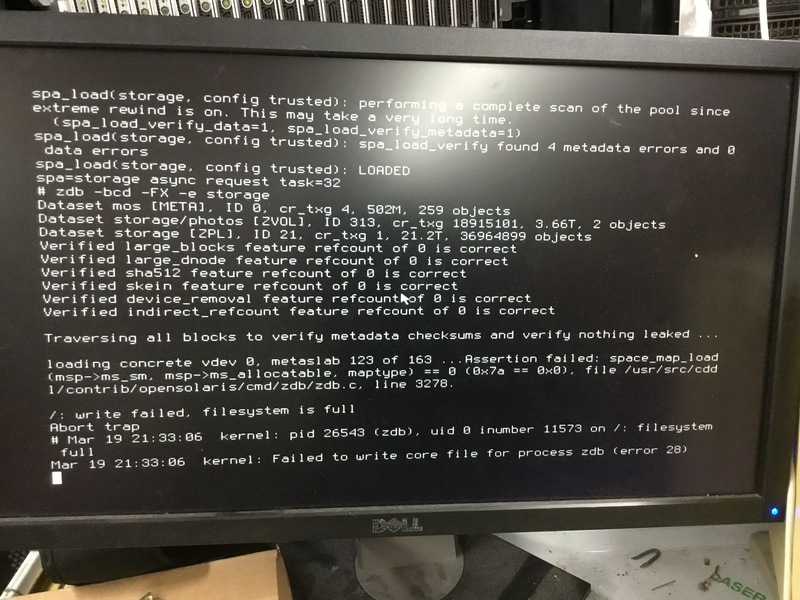 freebsd-fs - zfs corruption (again) due to interupted resilver and power faults. 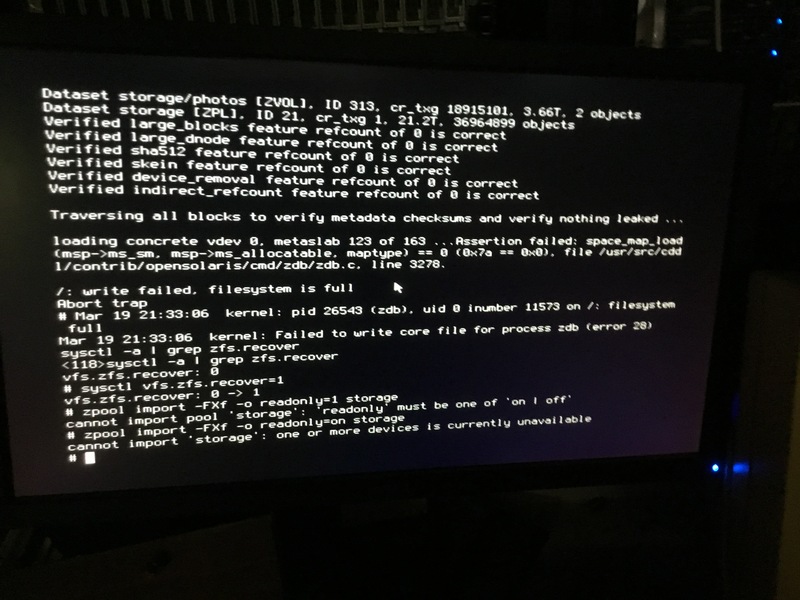 zfs corruption (again) due to interupted resilver and power faults. of the resilver when the power issue occurred. Thoughts on how I might recover this? 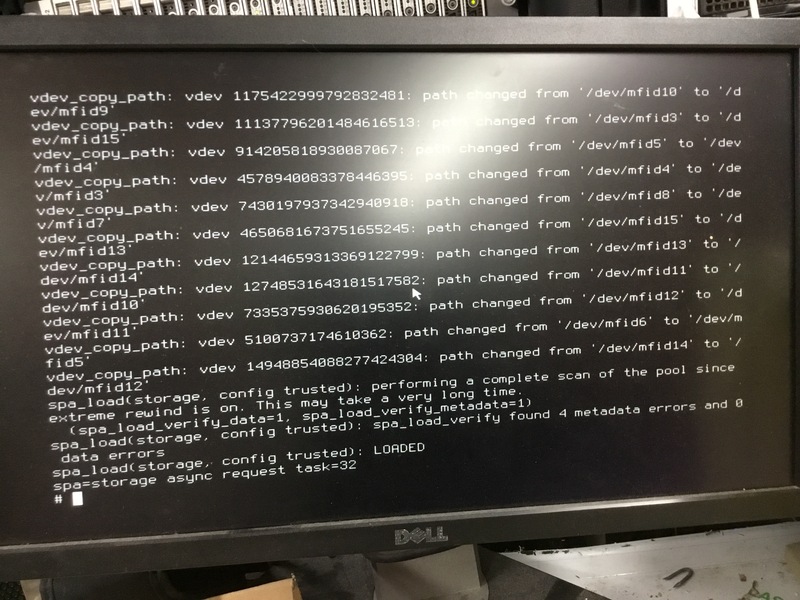 Re: zfs corruption (again) due to interupted resilver and power faults. 0x7a is 122, which is ECKSUM, it seems that your space map is corrupt. the pool with -o readonly? > of the resilver when the power issue occurred. > Thoughts on how I might recover this? > 0x7a is 122, which is ECKSUM, it seems that your space map is corrupt. > Have you tried importing with vfs.zfs.recover=1 set in loader and import the pool with -o readonly? >> of the resilver when the power issue occurred. >> Thoughts on how I might recover this? >> 0x7a is 122, which is ECKSUM, it seems that your space map is corrupt. >> Have you tried importing with vfs.zfs.recover=1 set in loader and import the pool with -o readonly? >>> of the resilver when the power issue occurred. >>> Thoughts on how I might recover this? > to ignore certain error aborts. > as the kernel module for all ZFS accesses. > these checksum checks non-fatal, too. > make most checks non-fatal, but it was not sufficient. > I cannot offer any more specific help, I'm afraid. > Good luck in recovering your pool! *root@colossus:/usr/src # mdb -Mkwe "spa_load_verify_metadata/W 0"
To get mdb working you *must* currently use -M to preload the modules.